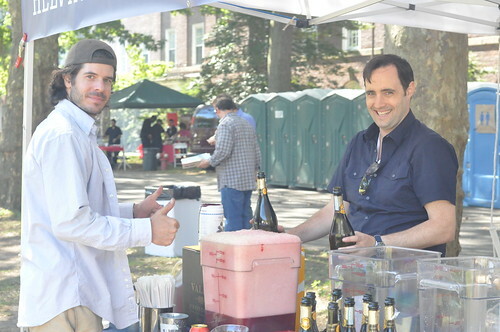 After all of the prep, I can't believe I didn't get a shot of our finished slushies! 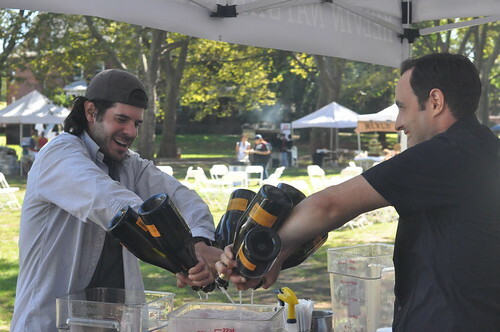 But here's a photo of Alex and Zack from Kelvin pouring that prosecco like a couple of bosses. They've recently launched a line of frozen cocktails and swank bars around the city, you can check them out at Cafe de La Esquina and Berry Park in Williamsburg, Coffee Shop on Union Square West, the Thompson LES Hotel poolside bar and the Gansevoort Park Hotel rooftop bar. A last year ago we discovered fantastic kebabs at Xin Jiang Prosperity Kebabs in Chinatown. 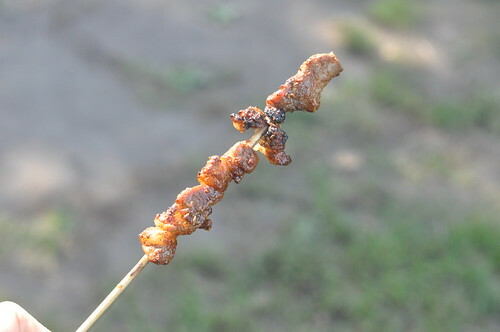 Their spicy lamb kebab was meaty heaven on a stick. 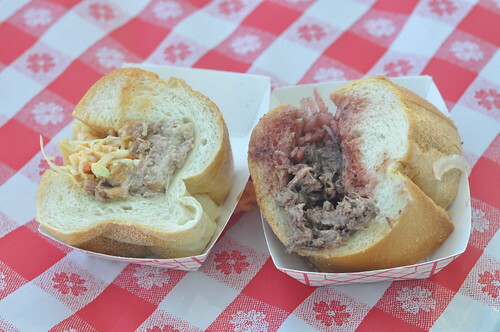 Mayhem & Stout's braised meat sandwiches were a highlight of my afternoon. The pork shoulder was so tender and flavorful that I had to have two(! ), thereby breaking Vendy eating strategy rule #1--Thou shalt eat, enjoy, move on and repeat. Had I been a little less bashful about my sheer gluttony I would have gone back for a 3rd and 4th, for sure. Ifu have to check these guys out at the DeKalb Market before it closes on 9/30. Follow them on twitter @MayhemandStout for news and pop-up locations. 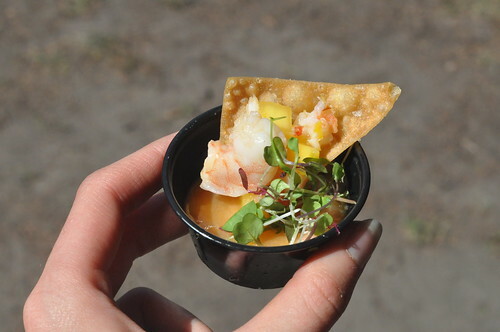 Another market vendor winner was the lobster and shrimp ceviche from Pestle and Mortar. Lobster, shrimp, and mango? Please! 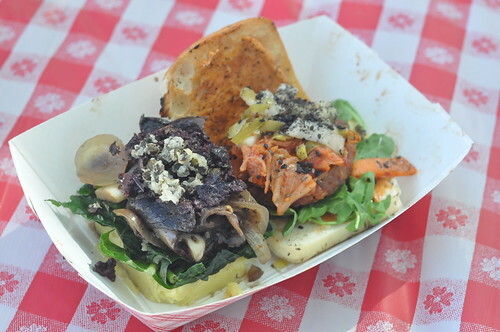 Special congrats to our vegan pals at The Cinnamon Snail who nabbed the People's Choice award this year. 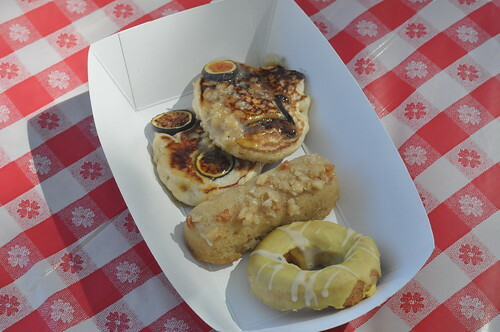 They did an awesome sampling of both sweet and savory options including many of my favorites (the gochujang slider, the portobello carpaccio, the fig pancakes and their rockin' chamomile doughnuts). 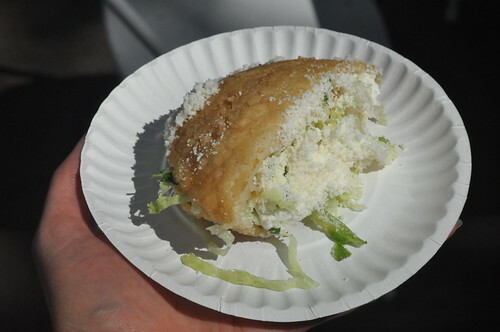 The gorditas from Tortas Neza were hard to put down (especially when piping hot...mmmm). 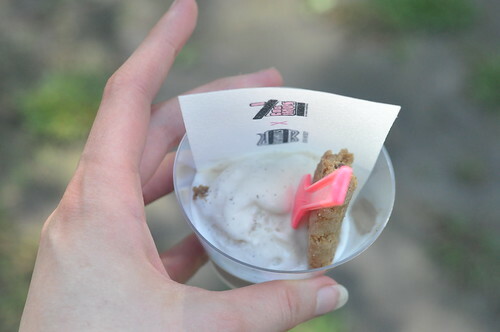 Bushmills and bacon ice cream with chocolate chip cookies from Coolhaus. Ohh, yeaah. There were several things I didn't get a photo of that deserve a special shout out: the mixed platter from Uncle Gussy's (Little B was chanting "Uncle Gussy's! Uncle Gussy's!") and the rose flavored lassi pops and mango and strawberry lassi shots from Monsieur Singh. Oh, those lassi shots. Still thinking about them and wishing they were more than just a shot. 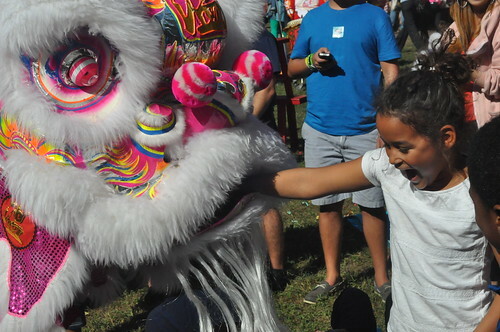 Even the dragons from Chinese Mirch didn't leave hungry. 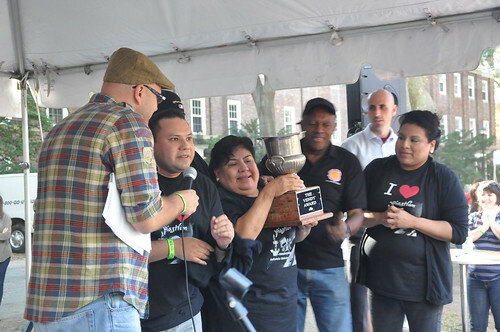 Congratulations to Market Winner, Lumpia Shack; Newbie Winner, Phil's Steaks, Dessert Winner, Melt Bakery, and this year's Vendy's Cup winner: Piaztlan Authentic Mexican Food (that makes 3 Vendy Cup wins for the Red Hook Food Vendors! ).